After doing more than ten years of African and contemporary dance, Rossana Galanzi started practicing Ashtanga yoga with Lino Miele in September of 1994 during a retreat in Greece. Upon returning to Rome, she continued her practice with Lino Miele and Tina Pizzimenti, while following Lino to many of his workshops abroad (Finland, Sweden, and India). In 1999, she began her apprenticeship as Lino's assistant, continuing to attend his workshops around the world. Lino, Tina, and Rossana, along with a few other dedicated students, founded "La Scuola di Astanga Yoga di Roma" in 2000. Rossana met Sri K. Pattabhi Jois for the first time in Helsinki during his 2001 European tour. She went to Mysore with Lino four years later to practice with Pattabhi Jois at the Ashtanga Yoga Research Institute. In November 2005, Rossana accompanied Lino on his trips to Canada and the United States as his assistant. From 2002 to 2008, she substituted a few months per year for the main teacher at the Ashtanga Yoga School of Copenhagen, also founded by Lino. 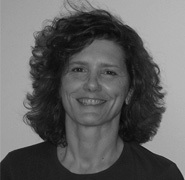 Rossana currently teaches full-time at the school in Rome. In December 2009, Lino honored Rossana with a certificate verifying her more than 12 years of apprenticeship with him.